Note: Previously titled Second Chances. "FANS WILL LOVE THIS IMMENSELY!" "AN EXCELLENT, FAST-PACED ADVENTURE! 9/10"
"EVERY WHO FAN SHOULD GRAB A COPY WHILE THEY CAN!" The Doctor, Gabby, and Cindy are threatened by the most deadly cosmic entity they've ever faced — one that could eradicate the Doctor's very timeline! 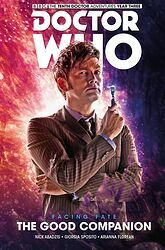 Year Three of the Tenth Doctor's comic adventures reaches its game-changing conclusion with devastating consequences for everyone on board the TARDIS! Can they make it out in one piece? Or will the fate of these beloved companions be changed forever? Writer Nick Abadzis (Pigs Might Fly, Laika) teams with artist Giorgia Sposito (Wonderland) to take the Tenth Doctor's impossibly epic story to the limit — and beyond! Collects Doctor Who: The Tenth Doctor Year Three #11 - 14.